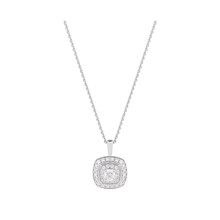 Proving that simple design has the ability to make a big impact, this Jenny Packham 18ct White Gold 0.35 Carat Total Weight Cushion Cut Double Halo Diamond Necklace will allow you to sparkle and shine, no matter what the occasion. 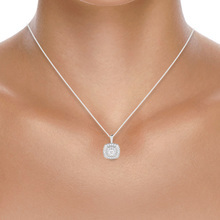 Featuring an endearing 18ct white gold finish and a 0.35ct cushion cut double diamond focal point, this necklace will complement and enhance your favourite ensembles with ease. Whether you’re in the office or sipping cocktails in your favourite bar, this elegant and sophisticated necklace is sure to turn heads.